Wine screw cap –with imported Saran-tin liner or Saranex liner, the stable sealing function could protect the wine with its fresh and enriched favor. All lacquer coating ink liner related are used on the product are approved by FDA. A screw cap is a metal cap that screws onto threads on the neck of a bottle. Its use as an alternative wine closure is gaining increasing support as an alternative to cork for sealing wine bottles. In markets such as Australia and New Zealand screw caps on bottles have overtaken cork to become the most common means of sealing bottles, right across the wine industry. Compared to cork, screw caps reduce the wine faults of oxidation and of cork taint, although it is possible to find TCA contamination in a screw cap bottle. Screw caps are generally perceived as easier to open. Screw caps have a much lower failure rate than cork, and in theory will allow a wine to reach the customer in perfect condition, with a minimum of bottle variation. Also screw-cap is environment-friendly. If cork represents the glorious history of wine, screw cap would be the brilliant future of wine. The most known brand of wine screw caps in China is HICAP, a packaging solution supplier being a strategic partnership of Diageo. The continuous innovation and stable large-scale production is an advantage of HICAP. In 2014, acceptance by Chinese consumers, 60% for spirits, 20% for wine and yellow wine, 20% for oil and other drinks. As a leader in this industry, HICAP is appointed as the drafter of Chinese National Standard of aluminum and plastic cap, which proves that HICAP would keep moving to be the professional closure project solution supplier and the world-class closures manufacturer. In 2013, 16.2 billion aluminum screw caps were used in Europe, 37% for ardent spirits, 22% for wine, 29% for bottled water and soft drink, and 12% for edible oil and other kind bottles. Among the 26 billion bottles liquors, 15 billion pieces are aluminum caps, and most of the high level olive oil and water also uses aluminum caps with estimated quantity of 1 billion. Screw cap used for wine was developed 40 years ago. Swiss wineries are the earliest to use aluminum caps. In 2000, wineries in USA, Australia and New Zealand starts to use Aluminum screw caps, by 2002, it has been accepted by France, Germany, Italy, Chile and Argentina. In the past 10 years, there was evident growth on wine aluminum screw caps, increasing from 100 million to 4 billion. It proves that wineries already realized the advantage of aluminum screw caps. The countries that aluminum caps are having an evident advantage over other caps include New Zealand and Australia, respectively shares 95% and 80%, South Africa and Chile shares over 60%. During 2005 and 2010, aluminum caps show a quick increase trend in Europe, especially in Britain (almost 50%) and Germany (almost 60%). In North America, the market share of aluminum cap is also increasing quickly. In 2013, China has overtaken France and Italy to be the largest wine consumption country with quantity of 1.395 billion liters, which equals to 1.865 billion bottles. Also China has become the 5th biggest wine producing country with production of 1.178 billion liters, and 80% of them were consumed in domestic. So it is really necessary to replace corks with aluminum caps in this rapid growing wine market. There is also big potential to use aluminum caps in other bottled products, which indicates a big potential market. For a lot of bottled products, aluminum screw cap has deduced a synonym for Wine quality. In the global scope, aluminum bottle cap get recognition by industry experts, producers, retailers and consumer. It can retain the Wine aroma and flavor well, which is the deliberate pursuit of the wine maker. The cork pollution (TCA), namely as three chlorobenzene , is a infection reaction between dilapidated cork and chlorine which make wine contacted with them has a musty smell and wet cardboard flavor. Basically every hundred bottles has 5%-15% wine suffer the pollution. And the emergence of the aluminum screw cap eliminates the hidden trouble, let crafted wine avoided TCA’s hard slain. Random oxidation -- wine in oxidizing environment can be quick maturity. Cork mainly depends on the elasticity of the stopper to make sealing surrounding. This kind of packaging is infected by many outside factors, and cannot be controllable. But screw cap has a smooth surface which can be controlled after sealed in the outer edge of the bottle mouth. No exactly same cork (permeability) in the world, but we can find screw caps which can ensure same consistency in the quality of wine . The sealing material has far-reaching effects to wine’s development and quality. In short, there is a part of the essence of wine aroma will be absorbed by cork, although opened wine is thought that can "breathe”. However, good bottle cap can ensure that smell of opened wine is same as the original. 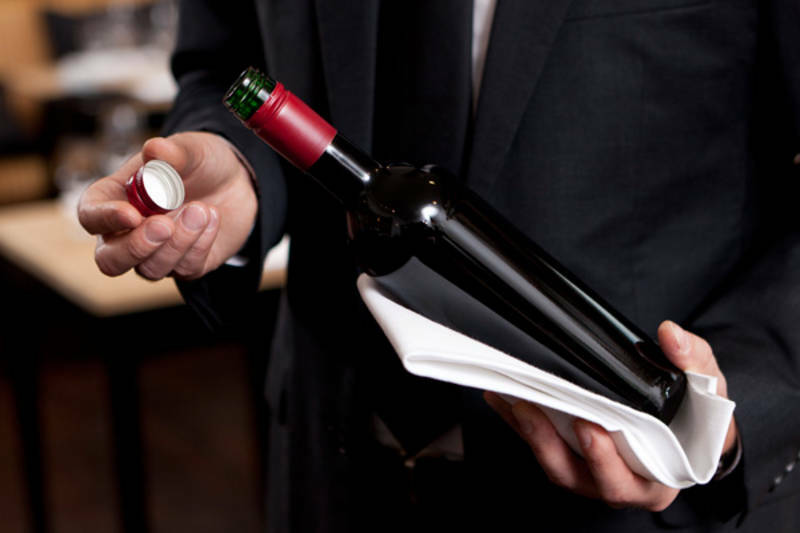 The bottle needs to avoid oxygen as much as possible because wine contacting with air will change smell. The screw cap is good housekeeping of wine’s aroma .Screw cap is suitable and reliable for long-term storage of wine. In fact, the use of screw cap can make wine placed in all positions. You can have your wine stored in any place according to your own like without worrying about other issues, whether in the home, or in the picnic party or nightclub. 5. Screw cap can endure the change of the outside temperature, humidity at utmost. Inherent strength and corrosion resistance ability of aluminum, working together with the specially-made liner can ensure unabated taste. Temperature fluctuations will make expansion and contraction of wine, resulting in a change of inner pressure in the bottle. Cork is very sensitive to temperature changes, therefore leakage often happens. Screw cap’s superior sealing function is effective to reduce the risk and can also prevent wine in cellar from being tainted by other odor and from insect damage to sealing. The traditional way to open a bottle of wine is to pull off the cork, which is not convenient to lots of people’s feeling. While it’s very easy to open a bottle of wine with screw cap, which does not need any special instrument, even to open the bottle with 10 years’ cellaring, just as easy as to open the bottle just come from the bottling line. Feeling the screw cap clicking, meanwhile the client could taste the sweet wine immediately. The advantage of screw cap is obvious that it could be done by mass production with low cost but higher cost performance. After optimization design, the screw cap price is obviously lower than that of the traditional cork. The aluminum pilfer-proof screw caps are with specific design style which could promote the complete product infection and upgrade the product. It composes the wine brand and visual effect as an essential part, just like the label says the wine production area, history and quality. The alcohol fraud is increasing, especially for the wine and Chinese spirit industry. Comparing with the brand hit and economic losses, the alcohol fraud brings worse threat to the client health and life. The company brand name will also be frustrated. As per the estimation, the worldwide alcohol fraud amount reaches tens of Billions US Dollars. In the whole alcohol manufacturing industry, the alcohol fraud product takes 12% rate. It is easy to tell if the bottle was opened by the bridges, with the cap bridges broken which means the bottle was opened. With more and more applying of the innovative technique on the aluminum caps, such as the exterior decoration, pilfer-proof design etc, which not only attracts different consumer, but also improves the caps pilfer-proof function. Hicap Closures not only provides the leading systematic caps packaging solution, but also offers innovative pilfer-proof packaging design, channel management etc. on different aluminum cap.